I failed at low-carb. I did really well for four day, and realized I love carbs and hated having headaches. I was getting a headache a day and took an hour and a half nap each day while my body adjusted. It was awful. 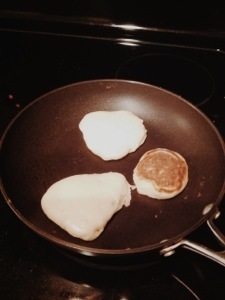 So, I made these pancakes yesterday. They were so easy! 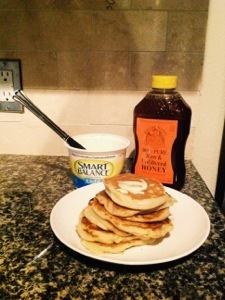 My boyfriend even said he liked them better than regular pancakes – they taste more like creme fraiche. 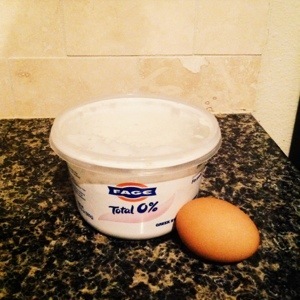 Combine the egg and yogurt. Stir until as smooth as possible – just make sure to get rid of the lumps. Add the vanilla and mix. Combine the baking soda and flour. 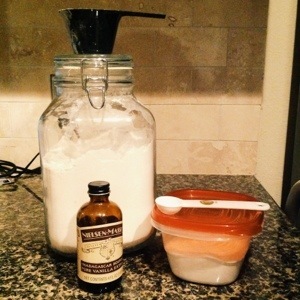 Combine baking soda mixture and yogurt mixture. Mix until well-blended and somewhat smooth. It will be pretty thick. Heat a pan to medium heat. Wait until pancakes bubble (about two-three minutes) and turn. Cook two-three more minutes. I topped mine with butter and local honey. Enjoy!